Mrs Parmly tells about how she heard about the dormitory fire. She has enclosed $200 for the replacement. 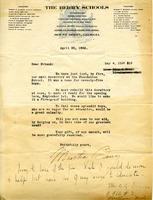 She also speaks about hearing Miss Berry speak and being impressed with the work and pictures of Berry. 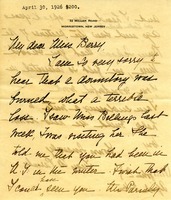 Anne writes to Martha with a 100 check to the Berry School.